Fear for the disastrous outcomes of climate change has driven many governments worldwide to invest in renewable energy. Compared to the other forms of renewable energy, usability of wind energy is much broader and it makes more economic benefit. Wind energy has very low harmful health effects than other old-style sources of energy which is noteworthy as a positive health benefit. However, this form of energy may lead to some adverse health consequences on the people living closed to the wind farms. The aerodynamic and mechanical sound of wind turbine can cause some health problems., According to observations, in areas where outdoor sound level is beyond the 45 dBA, complaints of harmful health outcomes are more prevalent when related to wind turbine noise (WTN). The World Health Organization reported that noises which have low-frequency nature have health problems such as “noise-induced hearing loss, interference with communication, and sleep and rest, psychophysiological disorders, disturbance in mental health and functions, effects on behavior, annoyance, and disturbance of activities.” In addition, symptoms of complications such as annoyance, sleep disturbance (SD), stress, and decreased quality of life have been reported among individuals exposed to the WTN., Studies have shown that low-frequency sound such as WTN and sound of air conditioner systems may have serious effects on individuals' health and cause SD., The WHO reported that SD is one of the main consequences of noise that can cause adverse health problems. Bakker et al. demonstrated a relationship between the annoyance induced from WTN and SD that means people with more noise annoyance experience more sleep problems. There are a broad literature for the effects of the sound exposure on the SD and health of people living close to the wind turbine power plants , but, so far, little researches have focused on the workers. Due to the higher exposure of noise among wind farm's workers, their health and sleep are severely at the higher risk. Thus, this research was done to study the effect of occupational noise-induced SD on general health among Manjil wind farm's workers. To conducting this cross-sectional study in 2015, all workers of Manjil wind farm, Iran, were categorized based on their job duties including repairman, security, and official groups. A brief orientation meeting about the aims of study and questionnaire completion method was set with power plant staff. For each occupational group, noise exposure was measured based on the standard method. In this study, a calibrated sound level meter analyzer (model TES 1358, China) was used for noise measurement. The WTN exposure level of employees at each job group was measured by 8-h equivalent sound level (LAeq, 8 h) based on ISO 9612. To achieve this goal, 15-min equivalent sound exposure level was measured for each workstation. Finally, the 8-h equivalent sound exposure level for each job group was obtained based on the field measurements and calculations in the mentioned standard. The ESS is a self-administered questionnaire with 8 questions. It provides a measure of a person's general level of daytime sleepiness, or their average sleep propensity in daily life. It has become the world standard method for making this assessment. The ESS asks individuals to rate, on a 4-point scale (0–3), their usual chances of dozing off or falling asleep in 8 different situations or activities that most individuals engage in as part of their daily lives, although not necessarily every day. The total ESS score is the sum of 8-item scores and can range between 0 and 24. A number in the 0–9 range is considered to be normal while a number in the 10–24 range indicates that expert medical advice is required. The higher the score, the higher is the person's level of daytime sleepiness. The ESS has a global reliability and validity estimated by Cronbach's alpha in the range of 73% to 88%. Finally, data were extracted and entered to and analyzed by SPSS 20, IBM, Armonk, NY, United States of America and the results were reported. The one-way analysis of variance (ANOVA) and Chi-square test were used to compare the general health and SD across job groups, age, work experience, educational level, and type of working shift. Then, the effect of noise exposure on the sleep and health of workers was studied by the simple linear regression. Multiple regression test was used to investigate the effect of sociodemographic variables and SD on general health and its subscales. In this cross-sectional study, 53 staff of the Manjil wind farm participated. The mean (standard deviation) age and work experience were 30.8 ± 5.9 and 14.1 ± 5.5 years, respectively. The values of LAeq, 8 h among repairman, security, and official groups were equal to 83 dB (A), 66 dB (A), and 60 dB (A), respectively. The average SD among the participants was 7.3. Moreover, the average somatic symptom, anxiety insomnia, social dysfunction, depression, and general health were 5 ± 2.44, 7 ± 2.35, 11 ± 2.65, 2 ± 1.54, and 22 ± 6.53, respectively. 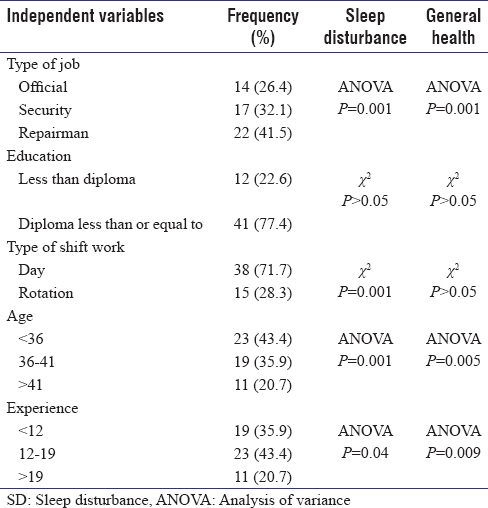 The one-way ANOVA was used to compare the general health and SD means among job, age, and work experience groups. Chi-square test was used to compare the GHQ and SD mean among educational level and working shift. The obtained results are shown in [Table 1]. According to [Table 1], the highest numbers of participants were in repairing groups with 22 (41.5%) employees and administrative staffs were the lowest groups with 14 (26.4%) employees. Approximately 77% of individuals were diploma and higher and daily workers formed 71.7% of total population. The obtained results showed that mean SD was equal in different educational levels. Differences of average SD among different groups of age, experience, type of shiftwork, and type of job were statistically significant. Moreover, there was a significant difference between general health means in job, age, and work experience groups. Effect of noise exposure on the sleep and health of workers was studied by simple linear regression. According to the results, every 1 dB increase in sound exposure will lead to an increase of 0.28 and 0.34 in SD and general health scores among the workers. In this research, multiple regression test was used to investigate the effect of independent variables on general health subscales. In this model, repairing group was considered as a reference group. The assumption of this model was investigated before fitting a regression model. Assumption of linearity and constancy of error variance was investigated using standardized residual plots against predicted values. The residual plots in all 4 regression models indicated the linearity and constancy of error variance. As well as, assumption of normality of data was confirmed by the normal probability plot. After checking the assumptions of regression model, a multiple regression model was fitted for all 4 subscales. In the first model, the impact of independent variables on physical symptoms was studied. According to the results, SD and noise exposure had a positive effect on physical symptoms. SD had the greatest effect on physical symptoms, so that when other variables are controlled, physical symptoms will increase by 0.89, as per unit increase of SD [Table 2]. In the second model, the effect of independent variables on anxiety and insomnia was investigated. According to the presented results in [Table 2], the SD and work experience were effective factor on anxiety and insomnia. SD was greatest affective factor on anxiety and insomnia, so that when all variables are justified, anxiety and insomnia will increase by 0.531, for every 1 unit increase of SD. Moreover, in situ ations where all variables were constant, an increase of 0.231 in anxiety and insomnia occurred as each year increase of work experience [Table 2]. In third model, effect of independent variables on social dysfunction was investigated. 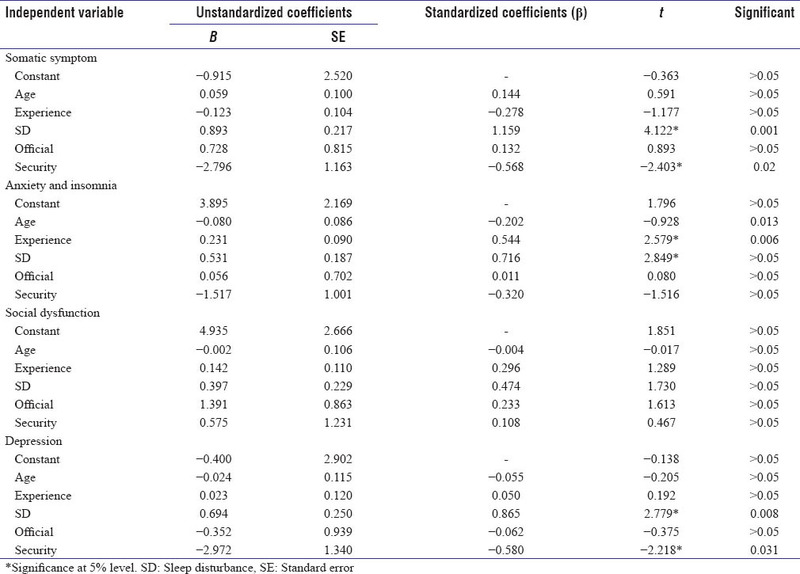 The results showed that there is no significant association between the independent variables used in model and social dysfunction of employees [Table 2]. In the fourth model, the effect of independent variables on depression was investigated. According to the results, SD and noise exposure had a significant effect on depression. In this regard, SD had greatest effect on depression, so that when other variables are justified, depression will increase by 0.694 for every 1 unit increase of SD. The coefficient of B for repairman (−2.972) showed that difference in average depression among different occupational groups such as repairman and security staff is statistically significant. Because of negative coefficient, it can be said that depression in security force is lower than repairman. The results of all four models are presented in [Table 2]. The effect of all independent variables on general health was investigated by multiple regression test. The results showed that SD and noise exposure had a significant effect on participant's general health. SD had greatest effect on general health when all variables are controlled, general health will increase by 2.42 for every 1 unit increase of SD [Table 3]. Finally, by comparing the results of the five models, it can be concluded that SD had greatest effect on physical symptoms and it had the least effect on anxiety and insomnia. As well as, SD had greatest effect on employee's general health. In the human studies, there are many factors that can affect response variable. Because of the genetic, environmental, and personal differences, hundreds of variables are effective on the response variable and many of these variables justify a very small portion of the variations of response variable. It is not possible to identify and model all of the influencing factors on response variable. Hence, the focuses are on the identifying of most effective factor on response variable. In this study, four variables including age, work experience, SD, and occupation type are the most effective variables on responses. Determination coefficient in the regression model shows the predictive power of the model. Determination coefficient in the fitted model on insomnia-anxiety, social dysfunction, and general health was more than 40%. It can be concluded that these variables could justify more than 40% of variations of response variables in the regression equation. In physical symptoms and depression models, all four independent variables justified more than 20% of variations of response variable. The small difference between the determination coefficient and adjusted determination coefficient means that independent variables which are added into the model are selected properly. Hence, the results of this study showed that all of five fitted models have suitable predictive power because all variables entered into the model are selected properly. Of the major adverse outcomes of environmental noise are SD and reduced general well-being. The results of this study showed that SD and adverse health effects on general health are increased as a result of exposure to WTN. Bidirectional association was found between SD, anxiety, and depression. This result shows that SD predicts and is predicted by anxiety and depression. Therefore, effective management of SD may avert the beginning of subsequent such as anxiety or depression. Overall, it can be said that WTN can cause SD and in this way create anxiety and stress indirectly. In the final model, SD was main predictor of general health. Exposure to the WTN was another affective factor on general health. Based on the results of [Table 1], noise exposure, age, and work experience were in relation with general health. It can be said that WTN has potential effect on SD and general health directly and noise-induced SD is a mediator for indirect effect of WTN on general health. Previously, review studies indicated that present knowledge does not support a direct association between WTN and health., These studies conveyed that there is a complicated composition of WTN and personal factors which can cause adverse health effects., Bakker et al. introduce a model in which WTN-induced SD and psychological distress had bidirectional association. They indicated that SD and decreased health can create a potential for greater perception and effect of WTN. In this study, it was found that WTN can affect sleep and health of worker adversely. Noise causes SDs directly and in this way it affects worker's health through SD, indirectly. The World Health Organization confirmed that the prolonged noise exposure can cause annoyance and SD and they may be affective on health and well-being., Shepherd et al. indicated that noise annoyance produced by WTN is in relation with anxiety and psychological disorders, and in the high level of WTN which annoyance is in its pick, it is expected that general health and well-being are worse. The result of the current study showed that effect of SD on general health is greater effect of noise exposure. It can be said that noise makes sleep problems and in this way it leads to health problems indirectly. SDs can cause anxiety that is a reason for other adverse health effects in individuals who are exposed to WTN. There are many factors such as fear, sensitivity, attitude to the WT and personality that can cause adverse health effects among people who are exposed to the WTN. Crichton et al. revealed that positive or negative beliefs about WTN affect individual's health. As well as, Jalali et al. indicated the negative effect of visibility of WT, noise annoyance, personal attitude to wind turbines, and sensitivity on the health and quality of life of people who are exposed to WTNs. There are several limitations in this study, which prevents a definite opinion about the effects of WTN on general health of workers of wind farm. First of all, the number of understudied workers was small. There is a need to study all the workers occupied in all wind farms of country considering the all possible difference. The self-reported studies have some bias and it is possible to avoid it by conducting objective studies. Fear of getting fired, medical history of workers, WTN exposure while relaxing at home and low financial support can be other affective factors that were out of the scope of the present study. The evidence from this cross-sectional study suggests that exposure to WTN is associated with SD and adverse health effects. It can be concluded that WTN affect worker's general health through the SD. The authors would like to appreciate all honorable participants and the entire staff of the power plant for their gracious cooperation. The authors declared that there is no conflict of interests. This article is extracted from Master's Thesis. The authors would like to acknowledge the financial support of Tehran University of Medical Sciences. Pedersen E, Persson Waye K. Wind turbine noise, annoyance and self-reported health and well-being in different living environments. Occup Environ Med 2007;64:480-6. Wagner I, Bareiß D, Guidati G. Noise Mechanisms of Wind Turbines, in Wind Turbine Noise. Springer; 1996. p. 67-92. Oerlemans S, Sijtsma P, López BM. Location and quantification of noise sources on a wind turbine. J Sound Vib 2007;299:869-83. Keith SE, Michaud DS, Bly SH. A proposal for evaluating the potential health effects of wind turbine noise for projects under the canadian environmental assessment act. J Low Freq Noise Vib Act Control 2008;27:253-65. Berglund B, Schwela DH. Guidelines for Community noise. Geneva: World Health Organisation; 1999. Pedersen E, Waye KP. Perception and annoyance due to wind turbine noise - A dose response relationship. J Acoust Soc Am 2004;116:3460-70. Nissenbaum MA, Aramini JJ, Hanning CD. Effects of industrial wind turbine noise on sleep and health. Noise Health 2012;14:237-43. Öhrström E, Skånberg A. Sleep disturbances from road traffic and ventilation noise - Laboratory and field experiments. J Sound Vib 2004;271:279-96. Kageyama T, Yano T, Kuwano S, Sueoka S, Tachibana H. Exposure-response relationship of wind turbine noise with self-reported symptoms of sleep and health problems: A nationwide socioacoustic survey in Japan. Noise Health 2016;18:53-61. World Health Organization. Available from: http://www.euro.who.int/en/health-topics/environment-and-health/noise. [Last accessed on 2009 Mar 09]. Bakker RH, Pedersen E, van den Berg GP, Stewart RE, Lok W, Bouma J, et al. Impact of wind turbine sound on annoyance, self-reported sleep disturbance and psychological distress. Sci Total Environ 2012;425:42-51.
International Organization for Standardization (ISO) 9612. Acoustics-Determination of Occupational Noise Exposure-Engineering Method. Geneva: International Standards Organisation; 2009. Noorbala A, Mohammad K. The validation of general health questionnaire-28 as a psychiatric screening tool. Hakim Res J 2009;11:47-53. Goldberg D, Williams P. A User's Guide to the General Health Questionnaire Windsor: Nfer-Nelson; 1988. Stansfeld SA, Marmot MG. Stress and the Heart: Psychosocial Pathways to Coronary Heart Disease. London: BMJ Books; 2002. Kaltenbach M, Maschke C, Klinke R. Health consequences of aircraft noise. Dtsch Arztebl Int 2008;105:548-56. Michaud DS, Feder K, Keith SE, Voicescu SA, Marro L, Than J, et al. Self-reported and measured stress related responses associated with exposure to wind turbine noise. J Acoust Soc Am 2016;139:1467-79. Pedersen E. Health aspects associated with wind turbine noise - Results from three field studies. Noise Control Eng J 2011;59:47-53. Joo EY, Yoon CW, Koo DL, Kim D, Hong SB. Adverse effects of 24 hours of sleep deprivation on cognition and stress hormones. J Clin Neurol 2012;8:146-50. Johnson EO, Roth T, Breslau N. The association of insomnia with anxiety disorders and depression: Exploration of the direction of risk. J Psychiatr Res 2006;40:700-8. Baglioni C, Battagliese G, Feige B, Spiegelhalder K, Nissen C, Voderholzer U, et al. Insomnia as a predictor of depression: A meta-analytic evaluation of longitudinal epidemiological studies. J Affect Disord 2011;135:10-9. Alvaro PK, Roberts RM, Harris JK. A systematic review assessing bidirectionality between sleep disturbances, anxiety, and depression. Sleep 2013;36:1059-68. Knopper LD. Wind turbines and human health. Wind Resources and Future Energy Security: Environmental, Social, and Economic Issues. 2015. p. 215. McCunney RJ, Morfeld P, Colby WD, Mundt KA. Wind turbines and health: An examination of a proposed case definition. Noise Health 2015;17:175-81. Berglund B. Guidelines for Community Noise. World Health Organisation; 1999. Available from: http://www.whqlibdoc. who. int/hq/1999/a68672.pdf. [Last accessed on 2014]. WHO. Night Noise Guidelines for Europe. World Health Organization; 2009. Pedersen E, Hallberg L, Waye KP. Living in the vicinity of wind turbines - A grounded theory study. Qual Res Psychol 2007;4:49-63. Crichton F, Dodd G, Schmid G, Gamble G, Cundy T, Petrie KJ, et al. The power of positive and negative expectations to influence reported symptoms and mood during exposure to wind farm sound. Health Psychol 2014;33:1588-92. Jalali L, Bigelow P, McColl S, Majowicz S, Gohari M, Waterhouse R, et al. Changes in quality of life and perceptions of general health before and after operation of wind turbines. Environ Pollut 2016;216:608-15.